During my learning days, when I hear a pressure transmitter (and other transmitters), it seems it is a very complicated instrument to calibrate (How about you?). But when I already learned and experience calibrating it, I can say that it is just calibrating a simple pressure gauge. the only difference is that the applied pressure is now converted into a current output, the 4 to 20 mA signal. In order to be understood by the user, it will be converted back to pressure units by the PLC display. 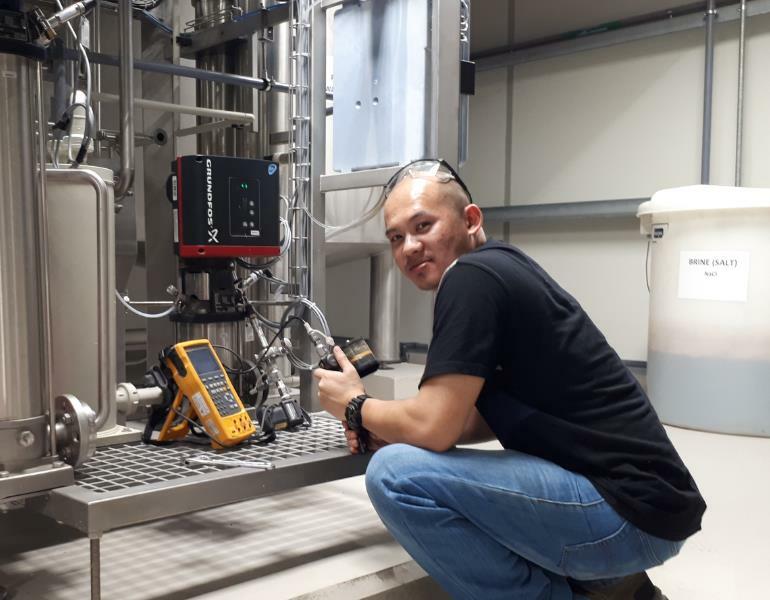 We do not need to know how to operate a PLC (but it is better if we do), what we need is, during calibration, it is important that the operator of the PLC is with you, make the user operate while you perform the calibration. This simple pressure transducer is a transmitter because it is used from a remote location going to a control panel (PLC) to monitor and control the process involving pressure. The signal is transmitted through a wire in the form of a current (the 4 to 20 mA signal). In transmitter calibration, not just pressure transmitter, an additional knowledge about linear interpolation is needed to understand the conversion of current output to pressure units or other units or vice versa. I get to be confused about this conversion when I was newly exposed to this so I will include the conversion formula here (just in case you are confused too). Just read on. 3 ways to set up a pressure transmitter for calibration. 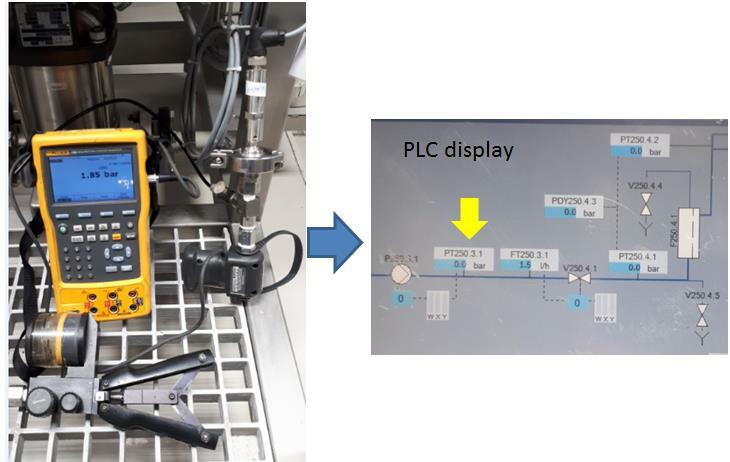 Loop calibration is a calibration setup where the instrument is calibrated as a whole involving the pressure sensor and transmitter inter-connected to the PLC display. It is a calibration where the instrument is being calibrated in its actual usage in a remote location from its display. The advantage of this is that you are getting the overall performance of the instrument. you can determine the overall functionality of the loop. The disadvantage is that if there is an error, you can not tell immediately what is causing it and troubleshooting may take longer. Loop calibration involves a 4 to 20 mA signal. Readings can be taken as current units or pressure units. Current is the signal that is being sent to the PLC Display but it is converted back to pressure units. If you want to get the current readings, you need to connect a multimeter that is in series with the wire going to the PLC. See no. 3 set up below. Remove the installation of the pressure transmitter on its location. Do not remove cable or wiring connections. 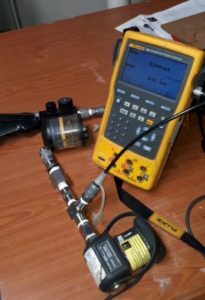 Using the proper fittings and connectors, connect the calibrator pressure output to the input of the instrument. See to it that there is no leak. Check and ensure correct tagging or ID in the PLC display to match with the transmitter in order to see the readings once pressure is applied. If you want to check the current value while applying pressure, you may do simultaneously the setup no 3. below. It is now ready for calibration. 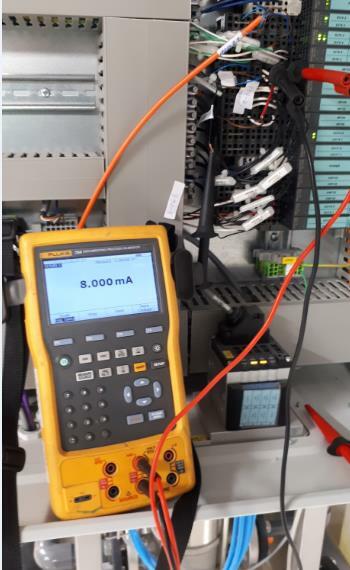 In this setup (which is also called Bench Calibration since it is removed from its installation), we will isolate the main instrument to other connections, only the main sensor that is directly tapped to our reference standard and reading is taken directly on the display of our references standard. This method is more accurate because no other outside sources of error are present. Troubleshooting is easy, you can directly determine the problem because you are just concentrating on the instrument itself. But the disadvantage is that mistakes may occur during the re-installation. So be careful not to interchange connections. Also, you need a special calibrator with a loop power to perform this. Instrument-only calibration involves the output signal which is a directly displayed as 4 to 20 mA. You need to apply interpolation in order to determine or convert it to pressure value or units. Remove the instrument from its location including its connecting wires. Ensure there are no other power lines to be disturbed. Connect the calibrator supply pressure to its input or instrument sensor. This is the same as loop connection setup. But this time, the instrument is isolated. Since the connecting wires are removed, the output ports are exposed. Check the transmitter connection diagram or label to ensure proper functioning and output signal detection. 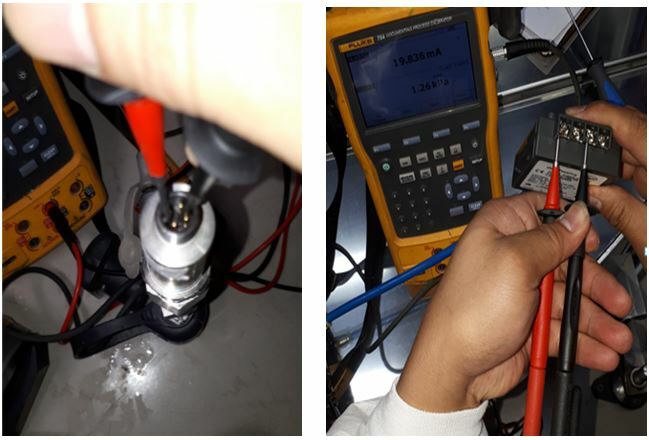 Since the transmitter is disconnected to its line, there is no power to it, in this case, we will enable the loop power of Fluke 754 to supply it in the transmitter. 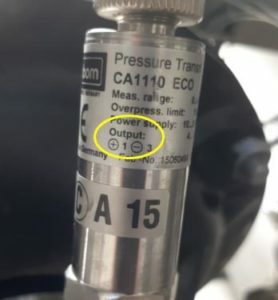 Pressure Transmitter output connection- Enable loop power of Fluke 754 for this procedure. At the same time and connection, we can read the output current that is based on the supplied pressure. Through linear interpolation, we can determine the output in pressure units. Compare computed value on the displayed value if within the expected tolerances. This setup is the easiest and most simple to perform. 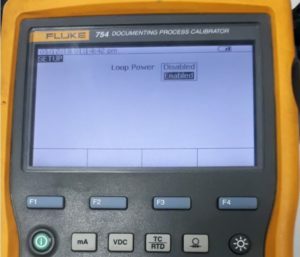 Just connect the Fluke 754 probe (or simply a calibrated multimeter) in series with the circuit or the transmitter current path and directly measure the actual current. This procedure may not be a stand-alone or sufficient procedure, it is preferred to perform together with setup no 1, but if there is no other option and the user approves this procedure, then it may not be a problem. This set up does not need any access or connection from the transmitter itself, only verifying the actual current then compute for the converted pressure value. The only thing you can measure is 0 pressure (4mA) and the actual pressure that is used in the process. Some instruments have an easy access where you can directly tap the current meter to a dedicated current-output port to get the current reading. especially transmitters. There are other process calibrators out there but this is what I always use since I started calibrating. It has pressure modules that have different ranges depending on your needs. If you have a lot of instruments involving pressure and temperature instruments, this calibrator is a must. 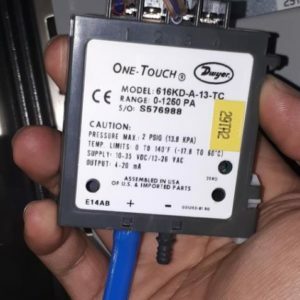 See the related article in this post about 11 Ways to use Fluke 754..
Diaphragm type connections– mostly used in a pharmaceutical company. Used in a liquid which has a solid particle that can clog on a simple NPT connector. I always like calibrating this type of connector because you can easily remove and return the unit. But sometimes, you need a dedicated fitting in order to connect it to the calibrator. For us, we need to have it manually fabricated in order to use it. NPT type connector– the most common type of connectors being used for general purpose. This is a 1/2 size NPT which is what we usually encounter. Vinyl Tube or Rubber Fittings for differential pressure– used for low-level pressures and mostly air is the medium used. As for its calibration, it is the same as a regular differential pressure gauge, just supply pressure to its positive side and let the negative side exposed to ambient. For more info about differential pressure calibration, visit my post here –Differential Pressure Gauge. Using the loop power for transmitters with no power supplied to it. 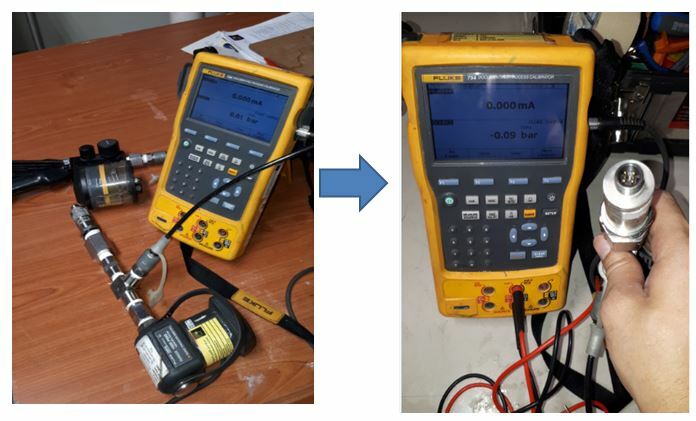 By enabling this in fluke 754 ( or other process calibrators with the same capability), you can power up a transmitter and read the 4 to 20 mA output signal. No other connections or power supply needed. Allow proper stabilization of the UUC and the reference standard (at least 30 minutes). Record five test points that are uniformly distributed on the range of the pressure transmitter, preferably 0%, 25%, 50% 75% and 100% of the range. Do not apply pressure yet to the hand pump, this is the Zero pressure setting. Current value should be equal to 4 mA. Check the display on the Fluke 754. Take note of the measured value and record on your data sheet. Apply the next pressure range and record the equivalent current value. Continue until all ranges are completed. Repeat the procedures for the 2nd trials each range. Make sure that all readings are within tolerances provided. If adjustment is needed, make sure to read the instruction or service manual. methods of adjustments are different for every manufacturer. Using Manual Computation or Linear Interpolation as a Method for Converting Different Output Units to Current. There is a formula that we can easily use to convert most (or all) units utilizing 4 to 20 mA signal to mA units. There are others out there but this is the simplest I know. Below is a simple formula for pressure to current conversion. 15.2 mA is the equivalent current value of a 7 Bar pressure. For Value or range which is not starting with zero ( with a vacuum range), use below linear interpolation formula. You can also encode this to excel for easier conversion. If you want to know and calculate the error, Just subtract the True value with your computed value. If the Pressure Transmitter has an accuracy of 0.5% of the range, then 0.005 x 7= +/-0.035 Bar, you can use this as the tolerance to determine a pass or fail results. Or you can ask the user for their respective tolerances. Transmitters are very useful instruments in monitoring and controlling a process remotely. One of this is the pressure transmitter, like other transmitters, a pressure transmitter is also using a 4 to 20 mA signal which can be measured and converted into the desired unit. In this post, I have discussed and shown the 3 setups that I always performed during pressure transmitter calibration. I also presented the different connections and fittings that you may encounter during calibration. and lastly, I presented how to calculate and convert a pressure value to current value using a simple conversion formula. Do you experience other setup and standards for calibrating a pressure transmitter? Comment below. If you like my post please share and subscribe. what instruments that I can include in my future post? How do you go about calibrating a vacum gauge using the Fluke 574? Fluke 754 has a different pressure module which you can choose with a dedicated pneumatic pump. The pneumatic pump (Fluke 700PTP-1) can be set to pump a negative pressure (vacuum) and the pressure module is the sensor to measure the vacuum input displayed in Fluke 754. Thank you for taking time reading my post. Yes, you are right, transducer and transmitter are different things. The transducer is the sensor that converts the analog (pressure) input signal to current while the transmitter is the one who transmits the signal through the cables attached. 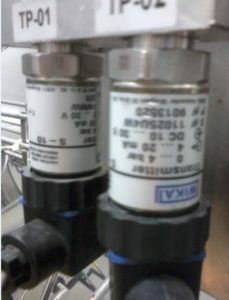 They are packaged as one in a pressure transmitter. Thank you for the comment, appreciate your inputs if you can add more. Well described procedure, I think any instrument technician can follow this procedure without a problem. Thank you for your comment once again. I Appreciate you liked it. I enjoy reading with your calibration awareness post. I have concern regarding calculation of errors. Of certain pressure transmitter 5 points calibration test. 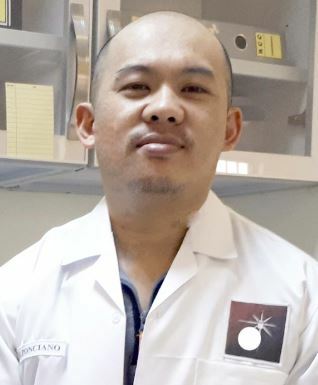 Hence the Accuracy of PT UUT is 0.5%FS can you share how will calculate the errors OR FORMULA TO BE USED in determining whether the hystheresis pass or fail against the required accuracy of the uut. Let say i will disregard the plant required accuracy. I am refering only the UUT required accuracy. What formula I am using currently is Error = actual value – ideal value/ Span ×100 for every increment test point. Example: actual value is 4.09mA – 4mA/16mA ×100. Then the result of this is to compare with required accuracy of the UUT. To determine whether pass or fail. Please comment or correct me if i am using the wrong way. Thank you and appreciate for your reply. Thank you for reading my post, I appreciate it. Your method of error computation is correct; you are just converting the error in the percentage of the span. But based on your example, you need first to calculate the actual value of the transmitter accuracy which is 0.5% of FS(Full scale). For me, it is better to use values in mA units first, then convert it to a percentage later. This is what I do in calibration; I will compare the accuracy of the pressure transmitter based on the output of the reference standards. Now, we will compare it with the computed error. Please note that the formula for calculating the pressure transmitter accuracy is different for every manufacturer. You need to consult its user manual.